In 1972, when in Europe, and in a particular way in Italy, motocross and enduro were emerging, in Prato, Tuscany, in the heart of that Italy where the imagination of some of the greatest people in history of motorcycle industry became reality, AIM was born, a firm whose innovations will leave their mark in the world of enduro and moto cross competitions. AIM is an adventure lasting fifteen years, studded with successes and innovations which are still used today in the motorcycle world. Towards the end of the eighties, however, a new discipline emerged globally, ready to open doors in a future that was still unknown, mountain biking. In 1987, Formula was born, devised by the same minds which had made AIM a reference in the motorcycling world, born from the same passion. The goal of this group of men and women is simple and at the same time pioneering, bringing technology of the motor world into the mountain biking one. In other words, Formula was born with the intention of becoming innovation leader. 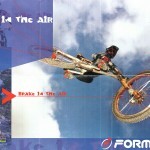 1993 is a year which determines a rebirth in the world of mountain biking, almost year zero. Formula takes an indisputable leading role in this innovation. With the introduction of the Standard, the first hydraulic disc brake in history was created, studied exclusively for mountain bike use. At that point, the bike world changed for ever. 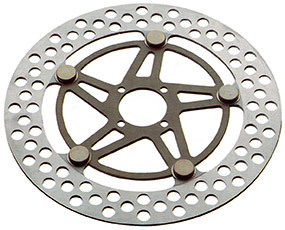 In the years which followed the introduction of the Standard, our brakes conquered, one by one, all the most prestigious titles in mountain bike competitions. These are the years of the epic models such as Evolution, B4 and ORO. Thanks to the help of the numerous athletes who we have supported with passion and dedication, over the years we have contributed to the conquest of numerous downhill world titles. A history created from devotion and love for the racing world, an aspect of our character which we have always had. 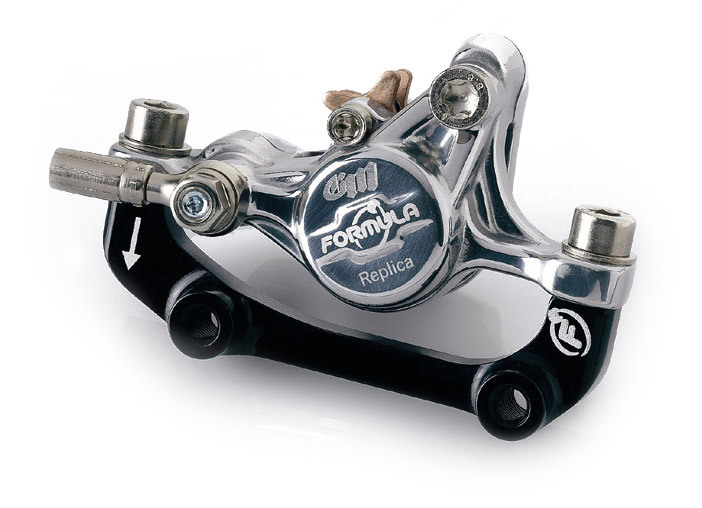 In a few years’ work, our designers achieved the aim which they had set for themselves, to make Formula brakes the milestone for the world of mountain biking, both from the point of view of performance and of quality construction. We had achieved an important goal, we had revolutionized the way to ride bikes forever. 2012, was for us, a moment to face a great, new challenge. We have always been very much involved in the world of suspensions. Since the times of AIM, our designers have worked closely with some of the greatest producers of suspensions in the world. 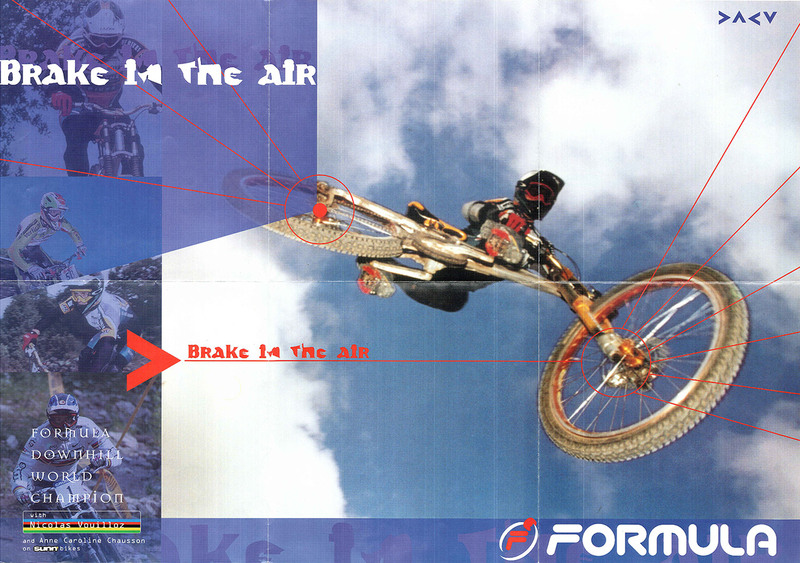 In 1993, we produced our first shock absorbers for motorbikes. The quantity of knowledge accumulated over the years and the entry of new specialists in the Formula family marked with natural flare the next step, that of shock absorbers for mountain bikes. This marked a return, not a beginning. In the motor trial world, today, our forks are considered the milestone for the discipline. Once again, we adopted a strategy which had already proved its success in the past, bringing our motor biking background into the world of mountain biking. The success obtained from entering the mountain bike suspensions world marked a new horizon for us, which led us to take on the production of a wider range of mountain bike components. Made in Italy is a brand which we use with pride, and we exemplify it in the deepest sense of the word. Made in Italy means joining the great tradition of Italian engineering. Leonardo Da Vinci, the first engineer in history, was born and raised just a few kilometres from our general headquarters in Prato. This history can be felt in the air, we are children and heirs of that tradition of Italian designers who for centuries have innovated in all technical fields and continue to do so today. We are what we are today because we are aware of the road which has brought us here. We have thought of, devised, and taken on challenges, we have got our hands dirty, we have made mistakes, we have started again and we have achieved results which at one time would have been unthinkable. In this way, we will continue to innovate today, still following an age-old lesson, but still at the same time, avant-garde.